To say we had a good season would be a slight under statement. From the first trip of the year to the last, the fishing off Esperanza was excellent. We had consistent fishing for Chinook’s, Halibut and bottom fish all summer. A big thank you to all our guests for making it such a successful and memorable season! Sorry to those we had to turn away. We filled all spots and were 100% full this past summer. Only a few spots remaining in our 2017 season! Predictions for the coming summer look great! We are expected to see solid numbers of Chinook, Coho and Halibut. 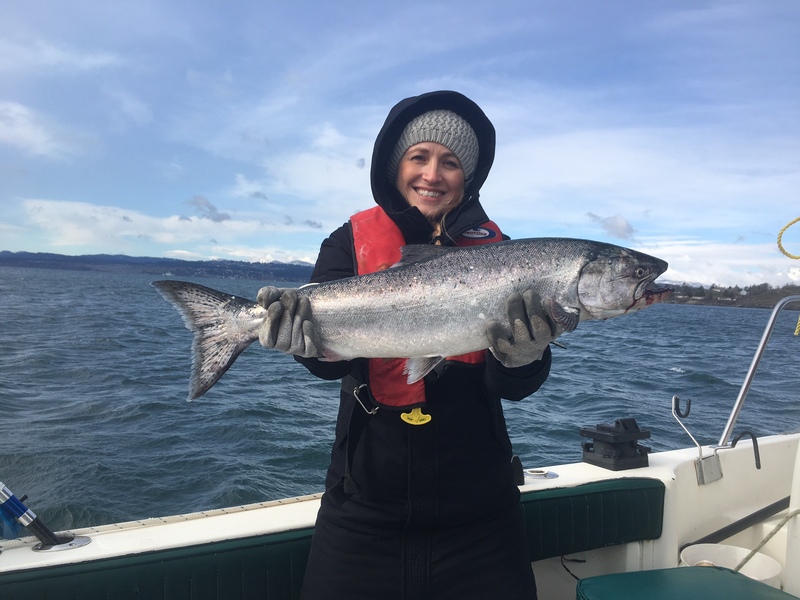 Our regulations are the same as the previous year with your allowable limit to take home being: 4 Chinook, 4 other Salmon (Coho or Pinks), 6 Ling Cod, 6 Rock Fish and 2 Halibut. With over 90% of our guests going home with limits of Salmon, Halibut and a mix of others, this makes for a freezer full of beautiful vacuum packed fillets for the coming winter. Remember all your vacuum packing is included in your trip with us. Many of the other lodges charge you for this service on top of your package rate. This can amount to hundreds more! July 2017 is SOLD OUT and June & August are Real Close! Well what a winter we’ve had here on Vancouver Island. I am writing this on March 5th and looking out at snow covered boats in my front yard. The Obsession Too went in the water a couple weeks ago for its first sea trial of the year with some new modifications. As you can see from the picture of Angie below, there are fish to be caught! We are ramping up for an incredibly busy summer lodge season. I am having fun testing out some of the new rods and fishing gear that suppliers are working to get to the market place. Once again our guests will be able to use the hottest new gear and tackle available. Happy New Year! We hope you enjoyed some quality family time and relaxation. 2017 is upon us and we are already gearing up for a BUSY season ahead!! The Reel Obsession team is proud to welcome back many returning guests this season plus a variety of new guests primed for their first experience with us. In 2017 we’ll have guests travelling from around the world to fish with us… from Canada, to all parts of the U.S., to Japan and Ukraine What a year it’s going to be! The largest Chinook of the year! With the 2016 fishing season behind us, we extend our thanks to everyone who joined us at the lodge and out on the water for a banner year. Another big thanks goes out to our staff that met and exceeded expectations all season long! With out the hard work, dedication and 24/7 friendly smiles we would not be ranked as one of the top lodges on the west coast. We kicked off our 2016 season in May with the Reel Obsession team and guests experiencing great action early on, through late May and June. We saw guests catching their daily limits including several of the largest Chinook and Coho to be caught in the past few years. Our Canadian Department of Fisheries and Oceans finally got it right! For several months now their scientific data has been predicting the salmon run of the decade. Wow they were right. It’s here. It’s early and it’s awesome!! Since kicking off the 2016 season, fishing has been fantastic. The Reel Obsession team has hosted groups from Japan to Washington state and many in between. Early season weather has cooperated and we’ve been sending everyone home with their limits of salmon and halibut. In addition, we have been catching loads of Lingcod and bottom fish as well. Guide Tallon hooked his guest Ian Woike into a 31lb spring on Saturday June 26th, the first Tyee of the year! Remember, this is early season and guests like Ian are already enjoying 100% success of limit catches battling Chinook Salmon (Kings) and taking this 31-pound beauty. The family and staff are arriving to put the finishing touches in place for another busy season here in Zeballos. We are excited to welcome guests from across our country and from all over the world! If you’ve left it late, rest assured there are still a few final spots left if you act fast. With the anticipation of the Chinook run of the decade, we wait in high suspense for the 2016 season to begin!! The anticipation is building for another start to a season and I am getting extremely excited to get back to the waters around Zeballos. Fishing around Victoria has been great the past couple of months, but returning to the lodge always gets me pumped up. We had our meeting at the end of March with the Department of Fisheries and Oceans, they are predicting a 10-year record run of Chinook along Vancouver Islands West Coast; we are in for a banner year! To say the 2015 charter season was a good one would be an understatement. We experienced some of the best salmon fishing consistently throughout the entire summer. Day in and day out the halibut fishing was excellent, not to mention we were able to get out for more tuna trips than any previous fishing season.